The march, called for by the New York chapter of Iraq Veterans Against the War, (IVAW) was a response to the October 28th attack on Iraq veteran Scott Olsen, whose skull was broken when Oakland police fired a tear gas canister at short-range directly into his head. Later in the evening, a dozen veterans helped lead a 1,000-strong march to New York Police headquarters to protest police brutality both against participants in recent “Occupy” protests and around the country in general. 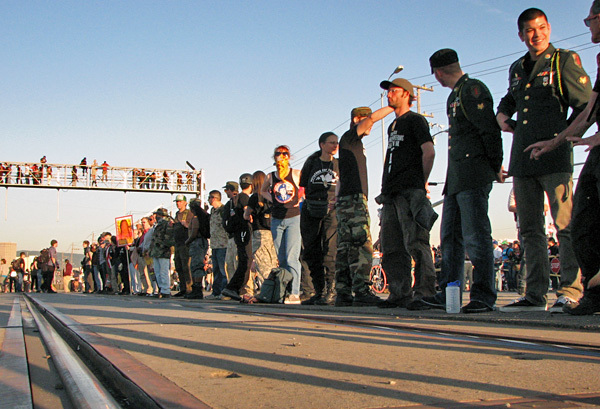 As night fell, a line of twenty-five veterans, mostly in full or partial uniform, stood at attention to help blockade entrances to the Port of Oakland, the fifth busiest in the country. Photo by Jeff Patterson. Meanwhile, the San Francisco Bay-area chapters of IVAW, of which Scott Olsen is a member, coordinated a contingent of dozens of Iraq and Afghanistan veterans for the “General Strike” march that brought tens of thousands to the streets and shut down the Port of Oakland. Wednesday’s marchers were an attempt to catalyze this force and to show to the rest of the movement that veterans, especially those who oppose the wars in Iraq and Afghanistan, are with them. IVAW has over 2,000 members and has been on the frontlines of the movement against the wars in Iraq and Afghanistan since 2004. The organization will be hosting nationwide events on November 11th, Veterans Day, to focus on sexual violence in the military and the situations faced by female veterans both within and after the military. See their site for more information.